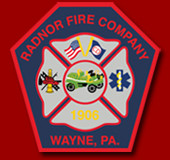 WAYNE, PA -- The Radnor Fire Company of Wayne today announced the results of its 2019 officer and board of directors elections which took place during Monday's April Company meeting. Robert L. Bruno, of Wayne, a 13-year veteran of Radnor Fire Company, was re-elected for the fifth straight year as Captain of the Company. Previously, Bruno served as Lieutenant from 2013 to 2015. Joseph Farrant, also of Wayne, was re-elected for the second straight year as Lieutenant. Farrant joined Radnor Fire Company in 2012. Also during Monday's meeting, John Schrems, of Wayne, an Honorary Active Firefighter and 34-year veteran of the Company, was appointed to the Board of Directors to fulfill the remainder of Peter L. Osgood's term. Osgood passed suddenly in mid-February. Re-elected to the Board of Directors on Monday were Francis Iacobucci, of Havertown, President of Francis Iacobucci Properties, LLC. Also re-elected was EMS Lieutenant and Firefighter, Vincent G. Albanese, of Chesterbrook, a four-year veteran of the company. Newly elected to the Board of Directors on Monday was Honorary Active Firefighter and former Chief, Douglas M. Felske, of Wayne, who joined Radnor Fire Company in 1973. Congratulations to these dedicated leaders who volunteer their time ensuring the safety of the citizens, property and environment of Radnor Township and surrounding communities.